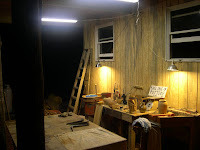 I was up late last night helping fellow potter-bloggers, Will Baker and Joy Tanner fire Will's wood kiln up on Roan Mountain. Unfortunately, at 1:30 a.m. I had to leave, but I'm sure they probably finished up shortly after I left. I got really charged up to fire my kiln and will have to get rolling if I want to do two firings next month. So since I'm trying to move and make pots this week I've decided that my broken camera is a sign that I should take a little time off. I will be back soon, though with news of the pottery. Have a great week! If you're near the mountains this weekend plan on coming over to Asheville for the first Friday Gallery crawl. I will be joined by Kyle Carpenter and Daniel Johnston at the American Folk Gallery for a show of pots! The opening will be in conjunction with the Cloth Fiber Workshop as "Exploring Surface Design: Surface Design Techniques In Clay & Fiber". The Cloth Fiber Workshop will have their opening from 6 p.m. to 9 p.m. while my opening will be from 5 p.m. till 8 p.m. The show will run through the 29th of August so if you can't make it for the opening you can see the work until then. But I understand that the gallery will send "home" any pieces as they sell. We hope to see you there. 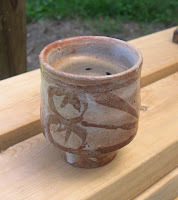 Well, here is one of my cups, again a little one I made for my daughters. I used my local clay and swirled it with porcelain clay. I modeled the handle from one I have of Lara O'Keefe. Although it looks like a handle Ron Meyers might have made See here. This cups stands proudly at about 2 inches! Just right for some italian roast espresso! The AKAR Show is up. Check it out here. 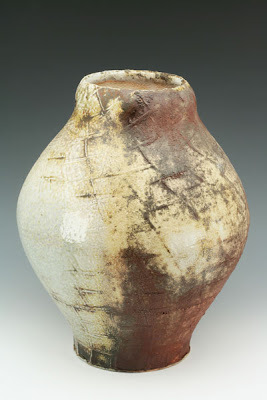 Also showing this month are pots from Simon Levin. Check his fine work out here (scroll down). Have a great weekend. Here are some exclusive pics from the show at AKAR that will go live shortly. 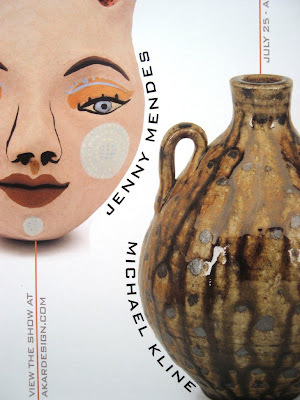 I hope you can view the show and see my friend Jenny Mendes' work as well. Click here to visit the AKAR website and see the entire show when it is up. These are tough times for the arts. It’s tough times for everyone - except a few - about 1% of our population. They have been tough times since the year 2000. I wonder what happened that year and has continued through today? I wonder. A few folks from that 1% could solve this problem themselves, but it may take a lot of folks like you and me. They need an Obama type internet fundraiser - lots of little donations - all at the same time. I sent my check in last week because I care deeply about center and what it represents. 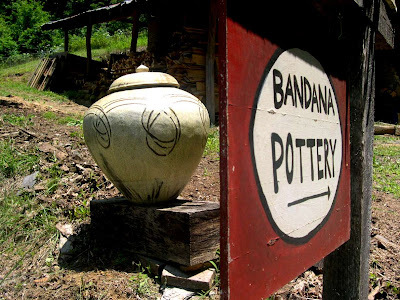 How many states can boast their own Pottery Center that celebrates its pottery heritage and promotes a future appreciation for what we do as potters? 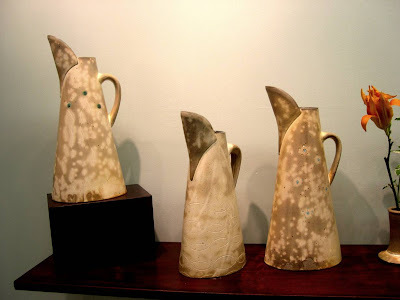 A few years ago I drove over to the NCPC to meet and learn from several potters from Turkey who had been in Washington D.C. for the annual Smithsonian Folklife Festival held on the National Mall. Where did they go before they returned home after that long ten day event? 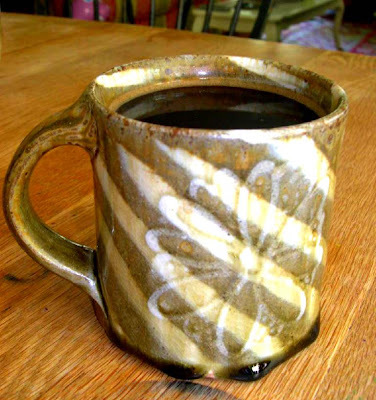 Seagrove and the NC Pottery Center! That's the kind of international, not just local reputation this area has for pottery. And the Center still has the potential to carry that torch. According to my site statistics there are a lot of you folks out there that read this blog and I am grateful for your "ear" and I know we, as a humble group, can make a difference just like Tom Starland has suggested. I hope you will please consider a donation wherever you are. Here is the link that you can go to to help out the Center. The Pottery Center and I thank you. Lucky 7! Hello all. My break is happening a little early today. What a surprise...Here a favorite mine from my main man, Sam Taylor, who is making some really sweet pots up there in New England. 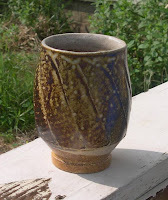 I can't say enough about Sam's pots, so why start now, I need to get back to my pots! (that are drying up in today's sun and wind.) But for those of you in the readership that are keeping score, this cup is made out of some really white clay, maybe porcelain. 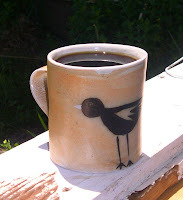 It's wood fired with salt glaze on a beautifully rendered round headed warbler. Back to the pots. Throwing outside is a real tricky situation, but I'm getting into it. Someday I'll have time to give Sam his due and write more about the pots. 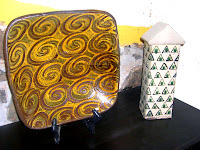 Samantha has fowarded this article written by Carolina Arts editor and publisher Tom Starland about the Pottery Center today. It's a nice story about the center and the various exhibits on display now. Check it out. Here is a shot from this years Pottery Center Benefit Auction. OK, this is getting sort of formulaic, isn't it. I've always been a collector of things and now I collect pots. Here is one of my absolute favorites, really. I got this M-U-G from Kim Ellington the first time we met at his shop in Vale, NC. It's a real mug, not like all of these other ones I've been showing. 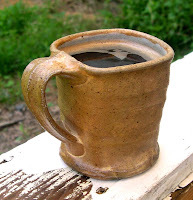 This one says mug all the way from its flat bottom to its sturdy roundish rim. 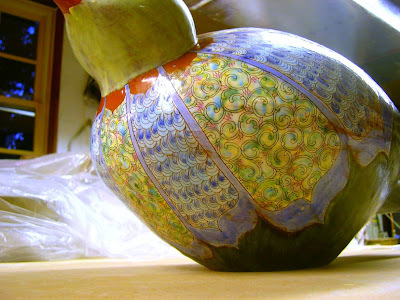 It has the kind of alkaline glaze I could only dream of, runny, dark, full of variation from its fire-birth. For a while, Stacey and I would rush to claim it in the morning for our coffee. Now it's afternoon and she's not around to compete. Kim fires his pots in his version of a groundhog kiln about an hour and a half from me and I occasionally get a chance to 'burn' with him. Kim came and taught with me at Penland a couple of years ago, and I will admit that I asked him to teach with me for selfish reasons. I love the pots he makes and the way he fires them. It's been great to get to know him and his family as well. 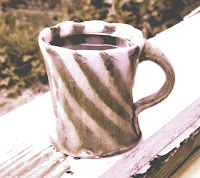 His web site is here and you can find out how you can get your own Kim Ellington mug, because you can't have this one. So many Michael's in the world of pottery. 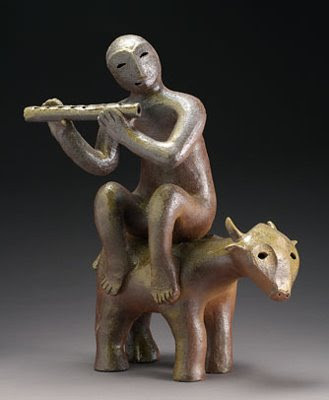 Yesterday I mentioned Michael Simon, my teacher and true master potter of the universe. Today, somehow I came across another friend, Michael Cohen. I saw his name pop up in one of these Google ads which I'm not supposed to mention. I met Michael C. in Massachussets when I lived there, what seems like, yesterday. Michael had started a pottery guild in Amherst way back when and I joined up during my stay there. It was a great group of people, including Angela Fina, teaching this session at Penland, more about Angie later. Here is a great picture of Michael that was originally taken 196?, and updated with one of his now famous tiles. 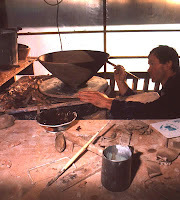 I include here a link to an interview of Michael by Gerry Williams in 2001 for the Nanette L. Laitman Documentation Project for Craft and Decorative Arts in America. (Is that some title or what?) It's such a long tile for a program that it's got to be part of the Smithsonian Institute, right? Right. 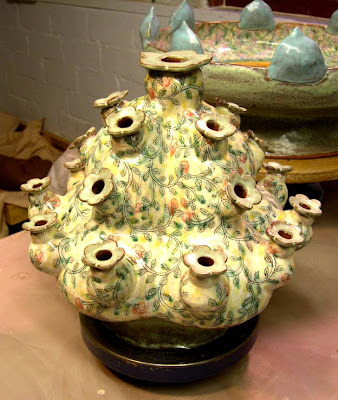 And here is another of the Nanette L. Laitman Documentation Project for Craft and Decorative Arts in America's oral history interviews of Michael Simon from 2005 conducted by Mark Shapiro. Two interviews for Tuesday. It may take you a while to get through these, but they are well worth the read. You can also search/browse the Nanette L. Laitman Documentation Project for Craft and Decorative Arts in America interviews here. This Michael is out of breath and out of time. There was a big DUh written in the sky in little puffy white clouds. After the clouds shape shifted into the perfect floor plan, I got to work. First I raked the ground from the large gravel Allen Wright had laid in there in January and re paved my new "summer studio" in red dirt! 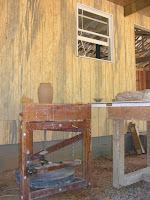 I set up the old Shimpo, the wedging table, and the treadle wheel along the wall. Next I bought some lighting at our friendly Ledger Ace Hardware store. After dark I went up and set the lighting and its attendant power strips and extension cords into a nice unencumbered arrangement not unlike knitting with electricity. As the BBC came on at 11p.m. I was about whooped and called it a night. Today I will get some clay out and do a sound check of sorts and hopefully report back with some pictures of the days produce. Have a good Tuesday! 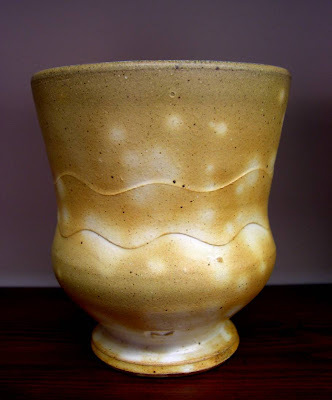 Here's a little fluted cup by Michael Simon. Michael gave this pot to my friend Sam when he was visiting Ga a few years ago. I had planned on going down with Sam and Hayne Bayless for a visit with Michael, but was home recovering from my table saw 'incident'. Michael sent this sweet little cup back with the guys and I have enjoyed it ever since. 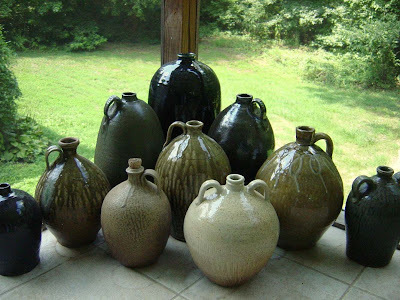 I visited with Michael and his wife, Susan Roberts last spring on my trip to Athens, GA. Michael was doing great and we looked over some of his pots in his house and he showed me his new studio where he hopes to make pots. It will be wonderful to see more pots from Michael when that time comes. 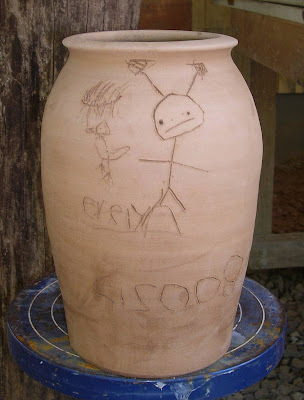 I gave this pot over to Evelyn to decorate and this what she came up with. I think it's going to look nice with a few leaves and vines painted on. There is a small bird and an alien. below she has signed and dated it. The drawing reminds me of work Don Reitz had done with his neice way back when. 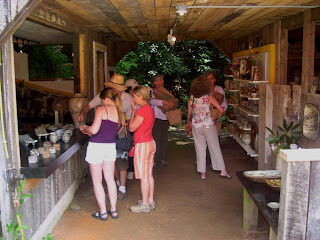 The NC Pottery Center is a wonderful institution promoting the history of pottery making in the state and its livelihood for future generations. Funding has recently been cut from the state budget. I wanted to share with you this letter from the Pottery Center as well as my own hope that you can join as a member to help keep the center open through these troubled times. We are writing to you because we have an urgent need for funds to keep the doors open at the North Carolina Pottery Center. Without immediate financial assistance, the Center will have to close in just a few months. most recently, 250 people attended the opening of our current exhibition, “Contemporary Pottery from North Carolina’s Indian Communities.” Some of the featured potters had never seen their work in a museum before. In a state that values pottery as we do, it makes no sense to close an institution that embodies what is certainly our most important and famous indigenous art form. 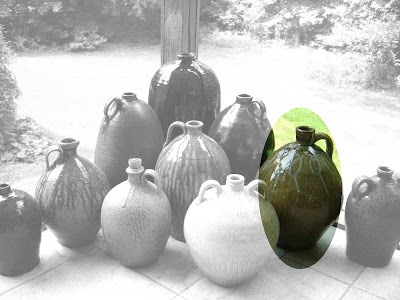 As you know, in December of 2007, the Board of the Pottery Center entered into an agreement with the Department of Cultural Resources to transfer the Center’s assets to the State and operate the Center through the North Carolina Arts Council. Funding for this move was inserted into the expansion budget at $300,000 but was cut from the Governor’s budget. As no legislator stepped forward to introduce a bill to support the Center, the current budget will not provide any funding. The Department of Cultural Resources does want to take over the Center and will ask for funding in next year’s budget. In the meantime, we have to keep the Center open, admittedly on a somewhat reduced schedule. We can do this if we can raise $100,000. The Arts Council has indicated that it will offer a substantial amount of support as well. This is to some degree a gamble that the State will come through, but we think it is a gamble that is well worth taking. Seven donors have already pledged a total of $10,000, so we are off to a good start toward our goal. All contributions are most welcome and are tax deductible. 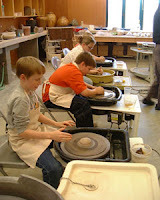 You can easily make your donation online by following the link at the bottom of the Center’s home page www.ncpotterycenter.com. 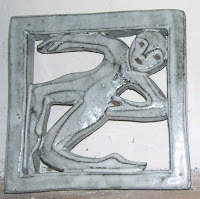 Checks should be made to the North Carolina Pottery Center and mailed to NCPC, P.O. Box 531, Seagrove, NC 27341. Donations of stock can be made to the Center through your local broker. This letter is just one part of a vigorous, multi-faceted, fundraising campaign. 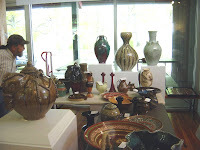 A very generous supporter of the Center has just given 250 pieces of pottery to be put up for auction, and a number of potters are organizing raffles of their work. We will announce other initiatives in the coming months. 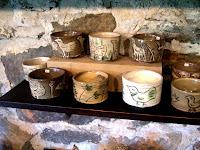 Some years ago, Pennsylvania potter Jack Troy wrote, “If North America has a ‘pottery state,’ it must be North Carolina. . . . There is probably no other state with such a highly developed pottery-consciousness.” Let’s keep that special pottery-consciousness alive. Please join us in saving the Center. If you would like to donate any amount click here. If you would like to join, click here. Once again a little cup from the cupboard. 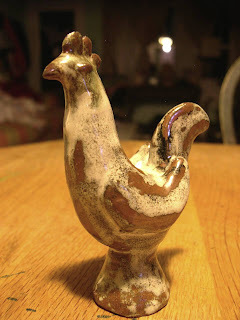 This was a gift from my potter friend Mark Hewitt. It was made by his former apprentice, Lara O'Keefe. I've never met Ms. O'Keefe but it is a fine little cup that I usually have to wrestle from the clutches of one of my girls. It's handle is very different from Linda Christianson's in that it is more round in profile, comfort in a different form. 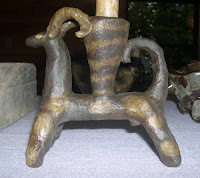 It has a whimsical "bud" pattern done in slip trailed Avery kaolin, would be my guess. Thank you, again, Mark(and Lara). I just got this in the mail. An advance copy of the card for Jenny Mendes' and my show at AKAR Design. Isn't it a nice design? Do you want me to send you one? Send me an email. Working outside had it's romantic rewards, but the reality of mosquitos, and a gentle breeze weren't a combination I'm used to, not to mention trying to find all the tools I have become accustomed to having within reach. So when the whistle blew at 5 today I had made one pot that was ok, the rest went back into the bin. I'm such a creature of habit and to think I could just whip out a dozen big jars in this new place was ludicrous. But tomorrow is another day. 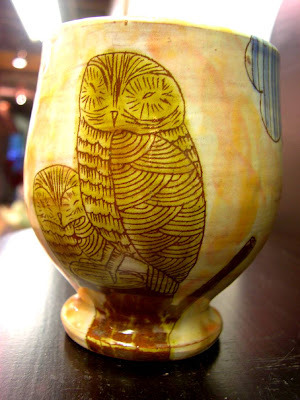 Potter Brownware, by Sarah Garland, could possibly be English potter, David Garland. There has been lively chatter on Clayart about the book. Here is his web site nonetheless. Nice work. 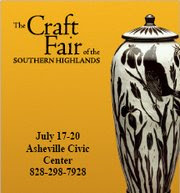 Just saw an advert for the upcoming Craft Fair of the Southern Highlands, and a beautiful jar by my bud Karen Newgard! Check out her web site here. Karen an avid reader of S&D and a top notch fantastic potter. I don't see enough of Karen since I never go to Asheville, but here's a shout out to you Karen, since I'm going to a wedding in TN and won't be able to come to the show. Good Luck this weekend, I'm sure you'll do great with pots like that one. 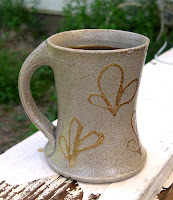 Well another day, another cup of coffee, before I go....back to my carpentry. I only need a little shot for the afternoon, so another little cup. 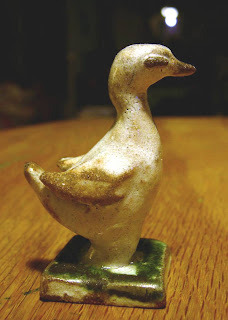 This one, by Linda Christianson, I won in a cup exchange at the Utilitarian Clay Conference at Arrowmont in 199? How lucky is that? It has a soft square shape and the bottom has a ghost pattern of black stripes from whatever pot was below it that fumed up, maybe a plate? I remember Linda at the conference was asked about her handles, which have a nice ridge in the center, "What if someone says that your handles are uncomfortable?" She responded, " Maybe that handle isn't right for them." Right on. I think some criticism is constructive, but at a certain point, one must stick with one's instincts. Whether its handles, or whatever. If it's true and it works for you, then most likely it will work for others, but maybe not everyone. Now back to my Vienna Roast...so long. Today's coffee break is happening in this Shawn Ireland cup. 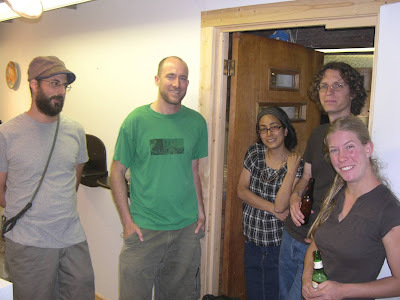 It's from way back when we were resident artists at Penland, probably 1999. For the longest time I drank out of it every morning, no lie. 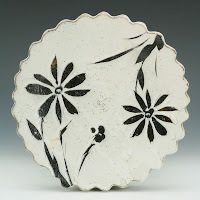 It's about 3 1/2 inches high and has some rare SPI brushwork, probably iron slip under a thin shino type glaze. There are a few small chips around the rim and it has a nice coffee stained interior from the thousands of cups of coffee I've enjoyed from it. 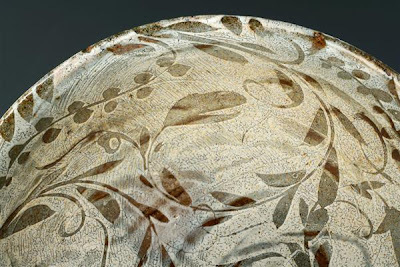 How much is a beautiful pot worth? Especially one that one has derived so much enjoyment? Today I'm meeting with Betsey Rose Weiss from American Folk Art and Framing. We're looking over some of the pots for my upcoming show there with Kyle Carpenter and Daniel Johnston. Off to the new studio for more fun filled carpentry. Have a good one. Black coffee with swirl and flower. Mmmmmm. 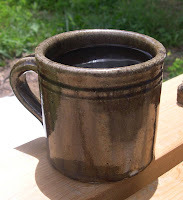 Fred sends this picture of the jug he bought from me last week here at the pottery. Can you find it, dear reader? It was a great visit and I'm proud to be in his collection. These are some sweet pots. Thanks for the picture Fred. 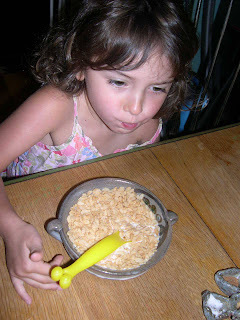 This morning there may have been a major shift in the cereal bowl department. Ron's bowls have reigned supreme for the past couple of month's. But today the 'peacock' bowl we got from Michael and Naomi may climb to the top of the dish rack. Here is Lillian giving it a test drive. Only time will tell. 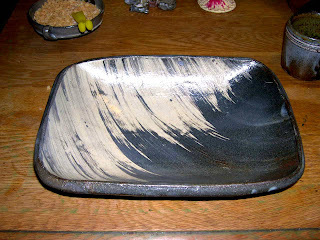 Here is a nice dish with beautiful hakame decoration that we acquired this weekend. I think they said they brushed an iron slip over the white hakame slip to create this very striking minimalist pattern. It made a perfect serving dish at last night's dinner with friends, Nancy and Mark and their kids. This afternoon I sat with some friends in the yard watching our kids splash around in the pool and realized, "Hey, I'm sitting here without a care in the world, not even pottery!" We started out the day with a fishing trip up at John Ferlazzo's pond and wound our way back and found ourselves in Bandana again, so we stopped by the pottery sale. 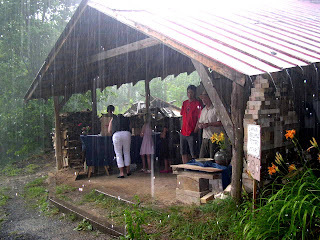 While we were there the rain came pouring down. We had so little will power and couldn't help ourselves from these Shawn Ireland birds. I don't think I've ever regretted buying pots, or birds, that I really responded to, but really couldn't afford. I heard once that you forget your extravagances, but regret your economies, or something like that...A long time ago Karen Karnes egged me on to buy a beautiful Jan McKeachie-Johnston basket at the Demarest Pottery Show. It was way beyond what I could afford. But I've never regretted it, and have since forgot what I paid for it. These birds weren't expensive at all, but with dwindling cash left for my new shop they seemed extravagant. I don't regret it a bit. The shop will get built. There was a good crowd when we arrived in Bandana, but plenty of great pots for everyone. We saw a lot of friends and neighbors and had some delicious snacks. Here are a few pictures that I snapped. 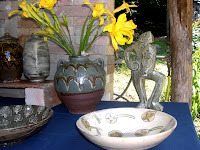 I'm heading over to Michael and Naomi's pottery sale today. If you're in the neighborhood you should definitely stop by. My other pottery buddy Shawn Ireland will be over there too. Here's a link to their web site for directions, etc. 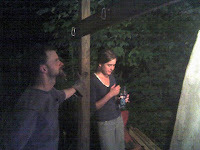 Went over to the "Barns" tonight and checked in with the resident artists of Penland. The residents host an open house every session throughout the school year. 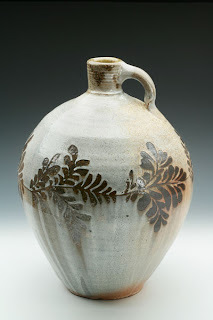 Matt Kelleher and Shoko Teruyama had some really nice pots in progress and in their gallery. Here are a couple of shots from their studio. It's hard to believe they've been here three years already. 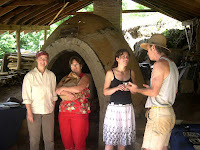 Luckily for the local clay community they will be moving to nearby Madison County, about 45 minutes or so from Penland. 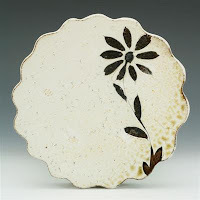 Matt and Shoko collaborate on a lot of the pots, heres a nice little cup thrown by Matt and decorated by Shoko. Here is a quiet cup by Matt. Some of the spots remind me of fireflies.